By the death of Kiyotoki-Shimomura on May 29th, 1922, at the age of fifty-five, not only Nippon, but the world at large, lost a master carver of noh masks, a branch of art peculiarly Japanese in spirit. 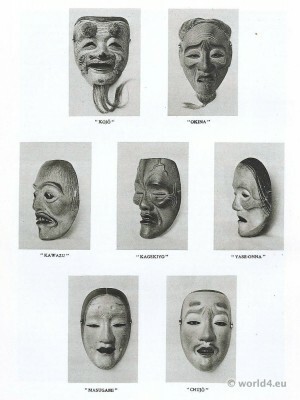 On account of the important position held by his family for generations in noh drama he was given rare opportunities of studying at close hand famous masks by old masters which were very rarely permitted to be seen except when they were worn on the noh stage. Not only that, but he had had a severe yet kind criticism on his work by Hōshō Kurō Tomoharu (Japanese Noh actor. 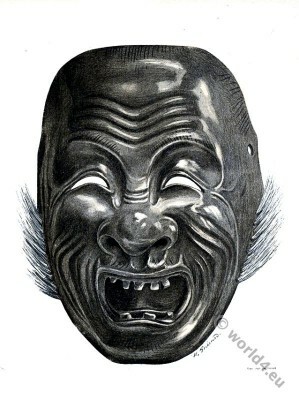 宝生 九郎 知栄; Fukagawa-san, 1837-1917), a great authority on the Noh, which spurred him on until at last he grasped the spirit of this unique art, and was able to produce masks that could favourably be compared with those of ancient masters. Okina. — The principal character in the piece called “Okina,” said to be the personification of Amaterasu, “The Heaven-Shiner,” wears this mask and dances in a prayer for peace under heaven and goodwill among men. It is considered to be the most sacred of noh pieces, and prior to the performance the “Okina” mask is placed in reverence in the green room with proper offerings of sake (rice wine), etc. Kojo – Is a kind of omote classified under “Jomen.” “Kojo” is worn by the elderly man, for example, in the piece “Taka- Sago”. Kawazu. — Classed among man’s masks. “Kawazu” is worn, for instance, by the ghost in the piece “Utow” or by the fisherman’s ghost in “Akogi.” In the former, the ghost of a hunter, who used to kill birds on the beach of Soto by deceiving them with his cries, is shown in torment in the after life. In the latter is shown the suffering in the after life of a fisherman who was sunk into the sea alive in punishment for casting nets in the sacred forbidden sea of Akogi. Kagekiyo. — This omote is worn by the hero of the piece named “Kagekiyo.” It was the sad lot of Kagekiyo, the brave warrior of the Taira clan, to be exiled and be reduced to a blind beggar monk. Yase-onna. (thin woman) is worn by the heroine in “Kinuta” who dies longing for the return of her husband from the capital where public duty detains him for years. The omote shows a woman’s face in sorrow of an intense conjugal love un- answered. This omote is also used by the heroine in “Teika” which deals with the love affairs between Teika, a famous poet, and a beautiful princess, whom he loved passionately and who died young. Masugami. — This is worn by the principal character in “Tama Kazura,” appearing as a ghost of a beautiful woman who relates to a priest how, fleeing from designing hands, she met a friend at the temple at Hatsusegawa by the mercy of the Kwannon (Goddess of Mercy) and was taken to a place of safety and happiness. Chujo. — This is worn by the ghost of Narihira in the piece entitled “Unryuin” appearing to Kinmitsu, who was a fond reader of “Ise Mono Gatari,” and explaining to him the secret meaning of passages in that book. It is also used by Michinori in the piece bearing his name in which the spirit of the dead warrior appears to a priest at the incantation of Buddhist sutra and relates his valour in the last fight at Ichinotani. This entry was posted in 20s, 20th Century, Asia, Japan and tagged Artist, Mask, Theatre on 1/28/15 by world4.